Just one problem : ocrfeeder can not find my scanner, even when it is connected to a USB port. Is there a configuration file to complete ? I recently skipped through the great Python and Gtk tutorial and getting more familiar with this so maybe I can contribute to this project at some time. But I’ll give the new version a try very soon! About the scanner, it should work if the device is detected by libsane. Can the SimpleScan application detect your scanner, by the way? Simple Scan Detect both my two scanners, an old Agfa SnapScan 1212 USB and a HP Photosmart 5520 (wifi). I have libsane 1.0.23-3ubuntu3.1. Might be a bug… I have no scanner here in order to test it, unfortunately. I will have to wait until I get back home. Thanks for this wonderful software. I’m a heavy Abbyy FineReader user but I want to switch completely to Linux. 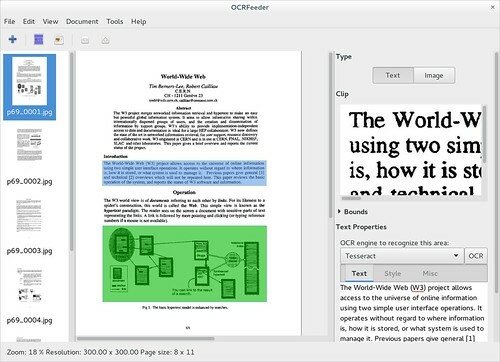 The only thing is that I can’t find any decent GUI OCR software for Linux, except this, that is developed…. from time to time…. Please, for the non-programmers guys like me, can you provide some PPA or DEB file to test this version of OCRFeeder? Thank you, and I wish you a Happy Christmas. Unfortunately I don’t have any PPA for you. Debian has up to date packages of OCRFeeder and Ubuntu usually also does too, although with a bit of a delay. For Ubuntu, I see that they don’t have the 0.8 version but it had some annoying bugs which 0.8.1 fixes, so hopefully they might include the packages for the latter. J’utilise OCRFeedumériserer pour numériser des textes dactylographiés sur plusieurs pages. – la recherche du scanner ne soit faite qu’une fois, au lancement du programme, plutôt que de la recommencer à chaque page. – qu’il y ait une commande “Numériser” en haut de page. – que le texte soit retourné quand il est mis à l’envers sur le scanner, ce qui est inévitable si le texte scanné est une page de cahier. Hello, thanks for the good work! This program has lots of parts clearly, from the unpaper treatment, text identification, OCR, etc… But it is hard to know if we can contribute or not if that is not completely exposed. A short exposition about that would be nice, or at least the exposition of these intermediary steps through ocrfeeder-cli would be nice already. And I won’t say that the Gnome Project page is… hard to get into and not very inviting, but consider putting it in some place like github or gitlab. The bug tracker will probably make it easier for the community to get involved and even help you with basic problems. Hello I have ocrfeeder 0.8.1 and ocrfeeder can not find my old USB scanner (Agfa SnapScan 1212 USB) ; see my previous message on December the 22. TypeError: pack_start() takes exactly 5 non-keyword arguments (2 given). Mmm, I’m really interest in this program but I can’t install it! I don’t understand the instructions. Can someone say me the commands I have to put on the Terminal? I’m so newbie in this.